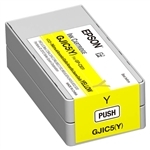 Choose from a wide variety of genuine Epson replacement ink jet cartridges made specifically for your Epson C3400, C3500, C7500 or GP-C831 label printer. A replacement Maintenance Box for the Epson C7500 inkjet label printer. Epson Part Number: C33S020596. The Epson SJIC15P 3-color replacement ink cartridge is used in the Epson SecurColor TM-C3400 Inkjet Color Label Printer. 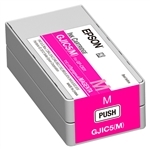 The high-capacity Epson SJIC26P(M) Magenta replacement ink cartridge is a used in the Epson C7500 ColorWorks Inkjet Color Label Printer. 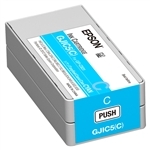 Epson Part Number: C33S020616. The high-capacity Epson SJIC26P(Y) Yellow replacement ink cartridge is a used in the Epson C7500 ColorWorks Inkjet Color Label Printer. Epson Part Number: C33S020617.